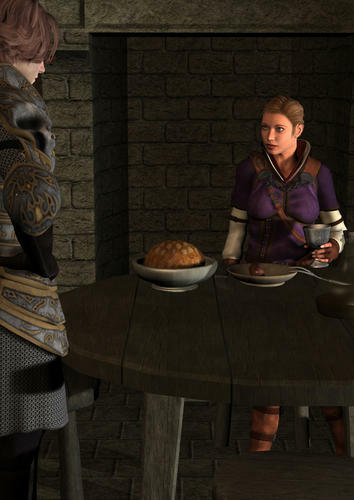 I did not know it was all ready in Daz software thank you for letting me know. You will still need to pose the hand so it is holding the item. As for the chain I would search on ShareCG.com and look for a Prop chain. I have a poseable one but I do not have the link. I bite at doing a search in Chrome, so I'll let you try that for yourself. I love the work you do with PS but I think you would get better at DS if you learn to use more 3D items and less post work for the main parts of your images. Jaderail is there a place that I can find tutorials online for new users of Daz apart for just doing a search in Google? As for Tut's wiibb I just searched all over the forums when I started. If you look in all the threads and sections you should find more than enough to get you started. Those Green I's with the links at the top of each Forum is a good place to start. They are there to help the users. Then go through all the Sticky threads in the Forums also, you will find some great stuff. Another prop question. Would I be allowed to use this prop? The licence says non-commercial use only. I can't say for sure and I would wait for one of the mods to confirm this but I think if you have a chance for monetary or prize gain from the image which includes a prop that has this type of license then I would say you cannot use it. But as I said best to wait for confirmation. No worries. Yes I was a bit cryptic with how I inferred it was part of Daz Studio. Most of the Time that means you can not use the item in any images you will sell, or be used in a published Free or other wise way. If you download the Item and Unzip it to a Temp folder the Readme may have a better discription of what it can be used for. If you do not like the terms just delete all traces of it and move on. EDIT: Yep let the MOD's decide. That's a better way to go. Ok then since you put it like that. :) Just got to tell myself "no geekyness allowed" when I go to bed....now. See you tomorrow. Thanks Szark and Jaderail, I will keep on searching. Edit: Found two similar lamps in the poser freebies on Rederosity and both are commercial and non-commercial licenses. Jaderail mentioned in a previous post about needing to pose the hand even when using the D/S script. 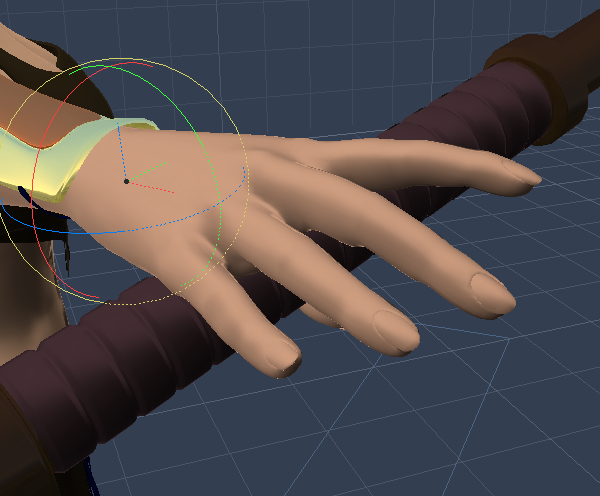 Posing the hand can be pretty easy if you have morphs++. For a basic pose there is a grasp morph which can be for either the whole hand or individual digits. It's not always the best way to go, but it's usually good enough to get you in the ballpark. 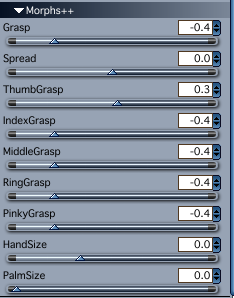 If you have the above mentioned morphs++ you can select the figures hand in the hierarchy, use whatever controls your software has to access the morphs and adjust the slider or dials the desired amounts. The above assumes you're using one of the Millenium 4 figures such as M4, V4, A4, etc. Darn good Tip EP!! I was thinking Genesis and just glossed over the Gen4's figures like V4 and M4. Thanks for that one. Problem is most peeps here are using DS, and as you all know Cho doesn't use DS, so it makes it problemsome. BTW on another question, When something says "Not for Commercial Use" Unfortunately Contests are counted as Commercial. I know very little of what I know and even less of what I don't. LOL you right. 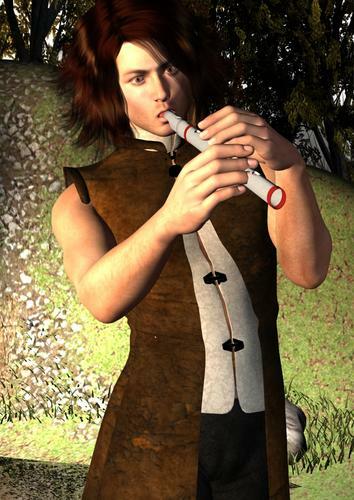 Try a Kiss expression on his face it should work for the flute. EDIT; I like the lighting. Still some small stuff to add, make-up thingies and jewelry on the dresser. Spent almost half a day on tweaking the bugger from the last sent image. Lighting has changed and while on the break from the guy with the flute this image sort of came up. Opinions and advice are most welcome. I must say, you are getting GOOD quick. For the Flute Image I really like the dappled lighting, I think I know what you used but I wont say :cheese: , I like it very much as it is. You could think of doing this if you like. Drop the girls arm to her side and have her holding something as well. This is a props in hand more than just just using props in the scene type of contest. I also think it could really add to the image if it was the right prop. I also like the new image much, I have no tip's for it. Maybe another will. 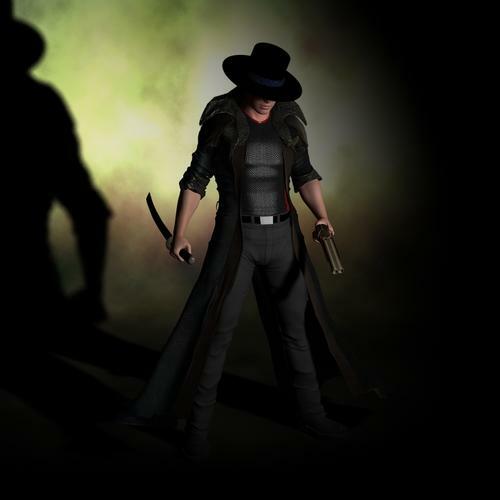 My latest go at this....just the beginnings of a idea for a new character for an post-apocalyptic hero. I am also still experimenting with lighting and shadows. I combined items from several different packages, still not completely satisfied but I don't hate it either. The hat seemed the be the most difficult, getting it to sit just right...was odd. 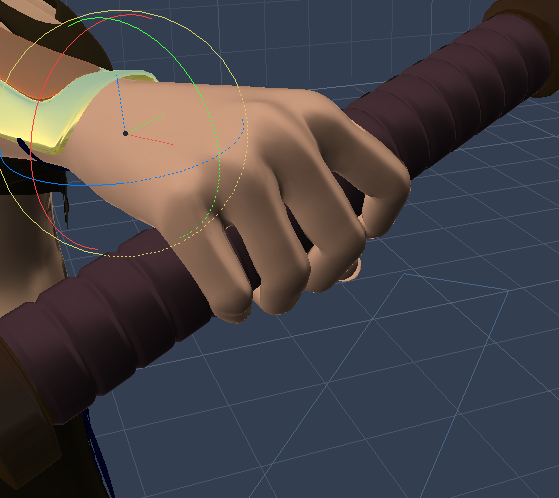 Of course, the auto-snap feature for the katana, didn't like the fact of the reverse grip. I got none. Looks good to me. Just throwing out something to think about: You can parent and use as a prop pretty much anything, including figures. An example of a figure used as a prop. V4 is parented (not conformed) to the troll and posed accordingly.